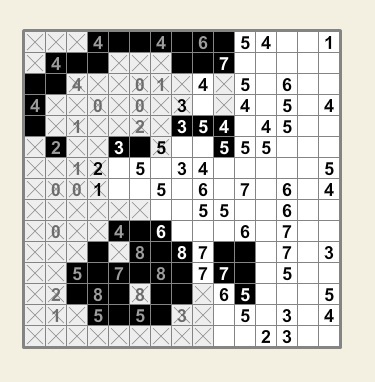 Status: offline Okay, so I'm new at Fill a Pix puzzles and can't figure out what clue I'm missing at this point in the puzzle I'm working on. It's driving me CRAZY! Can anyone tell me where a clue is? Status: offline I see two possible moves (there may be others). The uncompleted 8 needs one blank. The 7 to its right needs two blanks. If the 8's blank is one of the 7's blanks, then the 7's second blank has only one place to go: immediately to the left of the "6". Below that there's a 6-5. The 6 needs one more blank. That becomes one of the blanks needed by the 5. The 5 needs a total of three blanks, therefore all three squares to the 5's right are blanks. Status: offline Thank you Charlene!